My mom always recommend and sometimes force me to eat more banana but honestly, I do not like it a lot.Then I want to ask How many nutrients are in a banana? 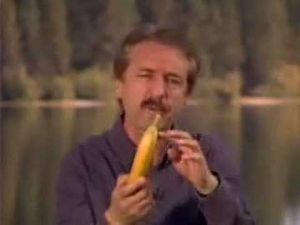 Re: How many nutrients are in a banana? But the big question really is, How many nutrients are there in an egg? One serving of banana contains 110 calories, 30 grams of carbohydrate and 1 gram of protein. Bananas are naturally free of fat, cholesterol, and sodium. Bananas provide a variety of vitamins and minerals: Vitamin B6 - 0.5 mg.
Is that the same when green then yellow then brown? Why is it that all fruit goes "off" but bananas just become "over ripe" ? Did you know monkeys open bananas from what most humans think is the 'wrong' end. Spinynorman wrote: Why is it that all fruit goes "off" but bananas just become "over ripe" ? It must be a biscuit then. Biscuits go soft when off and cakes go hard. Not sure what happens with banana cake. That's obviously because they don't believe in God and have never received his wisdom - as he designed it specifically for us and even put a tab at the top so we could open it easily.